Necomimi: Unboxing hours of nyan~! Big things come in small packages, or so they say. What’s more, it’s good, clean fun for Ages 14+! 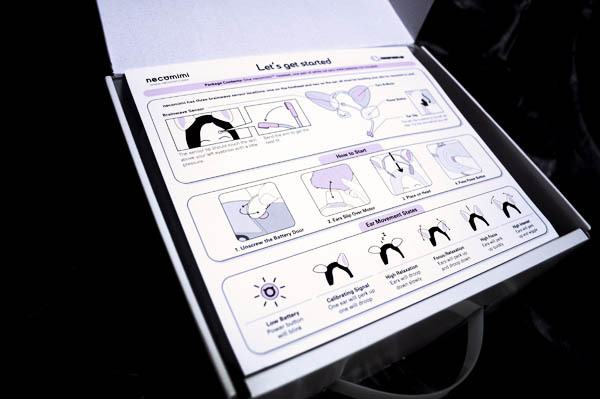 First thing you see when you open the package is this nifty little instruction sheet. And here’s what’s inside – your ears, the headband, and a healthy number of other gizmos to get you nyanning. Necomimi come ready to play right out the box, though some minor assembly’s required. It’s fairly intuitive process however, and all you really need to do is to pop in four AAA sized batteries, slip on the cat ear shaped sleeves, and strap it to your head to get started. 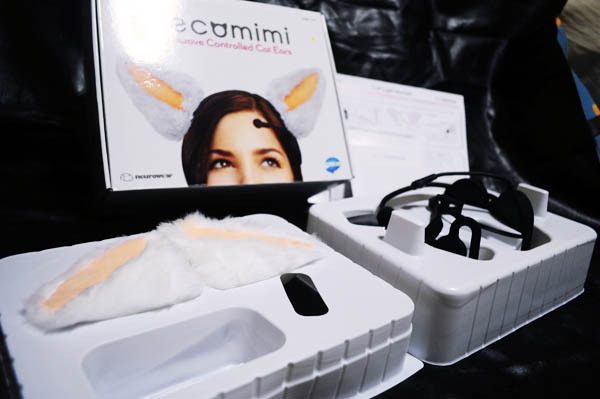 How it works is that it reads your brainwaves (you’ll need to make sure the ear clip’s fitted to your left earlobe and the main sensor’s placed above your brow for it to function properly), and the ears either move up, or down, depending on your mood. If you’re relaxed, the ears will droop down, and if you’re thinking about something, the ears will perk up. If you’re in a state of high interest or concentrating intensely, the ears will also start wiggling to boot. It takes awhile to get the necomimi calibrated (it took only a couple minutes on Crimson, but we didn’t get a reading from Angelus or our pack Elk till some 10-15 minutes later). After that’s done, though, it’s time to nyan~! We played 20 questions while wearing these cat ears, and true enough, they seemed to work like a charm. The ears were in a state of high interest each time we mentioned food (key words being ramen and yakitori) while Elk was wearing ’em, and it went the same for comic books (especially Gambit) on Angelus and games (MMORPGS) on Crimson. We’ll definitely be wearing these ears to conventions a lot more often, especially with customization options and different ear designs from neurowear in the works. We can also imagine this being a real hit with cosplayers, especially those portraying cutesy cat girls or characters from titles like Loveless and Lamento. 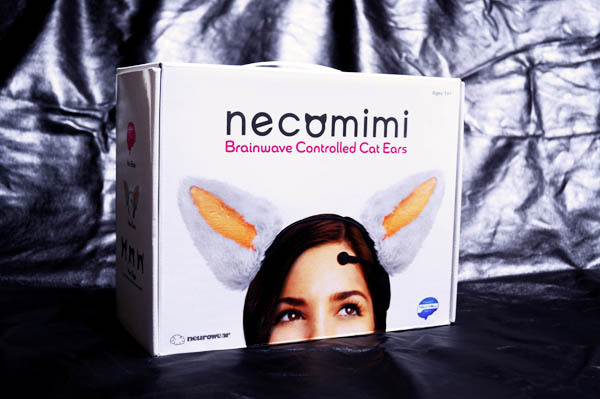 Necomimi add a healthy dose of realism to your cosplay for sure, but it’d help if there was a way to mute the sounds made by the motors or a more effective way to streamline the size and shape of the mechanisms. As it stands, it’s hard to hide the main sensor unless you’ve got really long hair, or are wearing a wig with a long enough fringe (which means these ears won’t work for just any old character), and the battery pack stands out a little too much for our liking. Of course, that’s not to say you can’t modify the designs on your own (we’re working on steampunking ours up) to suit your look. All told, it’s a great novelty item and potentially awesome cosplay accessory. 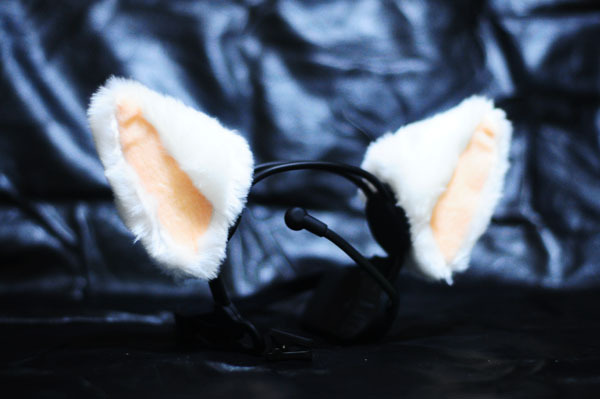 If you’re into kitty ear bands, and don’t mind the cost or shipping, you just might wanna check it out. Saturday saw COSMO Youth Parade 2012 kick off with a bang. The annual costume parade down Orchard Road saw revelers and cosplayers taking to the streets, and our team was in the thick of it, soaking in the festival atmosphere together with our friends from Project Zen (who were official event partners for cosplay), as well as cast members from this year’s Annual Cosplay Chess. COSMO 2012 also saw Taiwanese cosplay celebrity Neneko gracing the occasion as parade ambassador (check out our interview with her here). In addition to launching the event, she also had two autograph sessions, met with, and took pictures with local fans. The parade went into full swing at 5.30 pm, with a 300-m long dragon leading the way. This was followed by youth contingents, groups representing a variety of social causes, and cosplayers. This year’s route took us from Ngee Ann City Civic Plaza, down Orchard Road and through 313@Somerset, and back. In addition to the parade, visitors at the event were also treated to a variety of fringe activities, including a variety of games, song and dance performances, and in the evening, a full-fledged concert by local bands.